Orphans have rights too - but they'd rather be well-known than forgotten. The story is too common. Some author comes out with a book, then dies - but no one cares. Or an author publishes under a corporate name, but that corporation dies - and no one cares. In both cases, the works which sit around may or may not be public domain - but there's no one who can tell you whether they are or aren't. If you try to publish as public domain (especially on Amazon) you will hit a reject, as you can't prove it's in the public domain. There is a trick. The logic lies in your business plan. Simply re-publish the book (and be prepared to un-publish it at anytime.) You leave the copyright as owned by the original author or company, but go ahead and publish your own edition. Unless you do something greedy, the worst you will get is a "cease and desist" where you have to take these down. Meanwhile, you've had some sales and more than paid for your investment. Low risk, chance of profit. Even if you spend a great deal of time marketing these books, the search engines will simply send them to your "missing" (404 error) page, which you can rig to promote your other books. The advantage is yours, since you've done the research and found a real treasure that no one else cares about, but fits into your own niche and the bliss you are following. I found a classic book, which was being republished in hardcopy (somewhat) but not marketed or provided widely as an ebook. The copyright was 1965, which is two years after the public domain copyright extensions took effect. However, the copyright was owned by a company which didn't exist, according to any amount of research I'd been doing. That hardcopy edition was running as pure profit, since the publisher had a contract (apparently) with the original company, but was able to simply reprint as needed with nowhere to send the royalties to. What I saw was that this book wasn't being marketed and wasn't being provided as a ebook much of anywhere - so the potential for a few hours work and years of profit appeared. But I couldn't say the copyright was mine. I could, though, do the same trick this hardcopy publisher was using - leave the original copyright as it was and simply become yet another publisher. Again, all I had to lose was a few hours' time editing the book, creating a new cover and meta-data, and porting this to the book distributors I normally use. If it did ever come back to bite me, all I'd need to do is spend a few minutes taking it down from the various sites. Meanwhile, all the sales I'd had up to that moment were mine - and that moment would probably never come. The only reason I would do this is because the book fit into a series I wanted to produce as a bundle with 5 other books which were all public domain. The author had willed his published work with a non-profit association (which wasn't working at publishing these books very hard, offering only poor-quality PDF's with errors in them) and his unpublished works and papers had been willed to a long-time student and supporter. So the publishing company which originally published that orphan fell into the cracks. But that's as far as my research took this. Now that I have a breakthrough (don't re-copyright, just re-publish) I have a solution to a few more books than before. 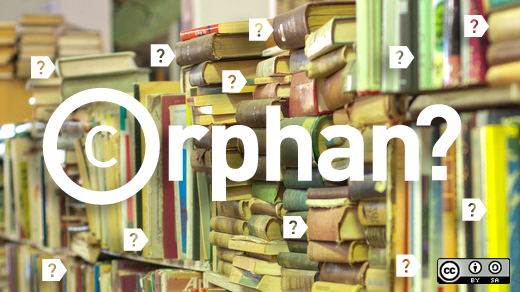 Yes, it will still take some time to establish that the books are orphans. And there are greedy publishers which may be trying to corner the market with their over-priced hardcopy versions. But "nothing ventured, nothing gained" very much applies.